When scanning the list of remaining peaks I have on the San Diego 100 Peaks list, I realized there was one that wasn't either a 2-hour drive or had double-digit mileage. As you see, I appeared to have saved the best and most challenging peaks for last. 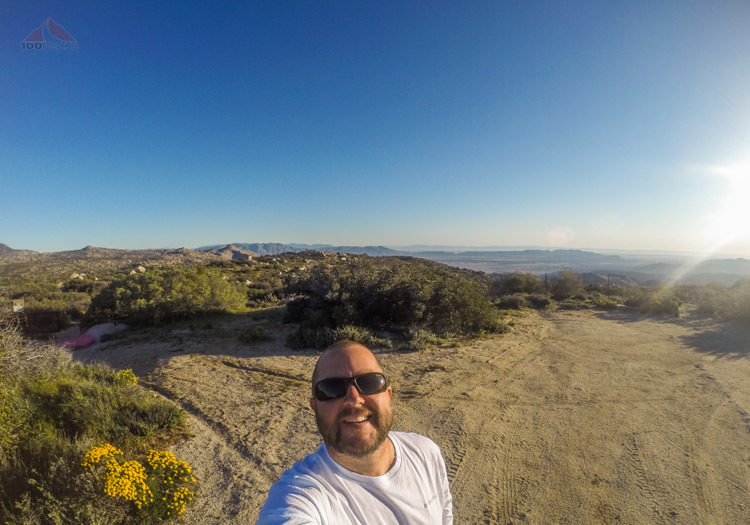 I saw Peak 3339, at the edge of Anza Borrego Desert State Park, with a shorter drive than all the way to the desert floor and decent mileage. I started off before dawn and drove my familiar path to the mountains. It had been a long time since I'd come this way, and I felt a rush of nostalgia as El Cajon Mountain caught the rising sun. I exited the freeway at the 94 and took Old Highway 80 to McCain Valley Road, completely ignoring where my GPS was telling me to go. 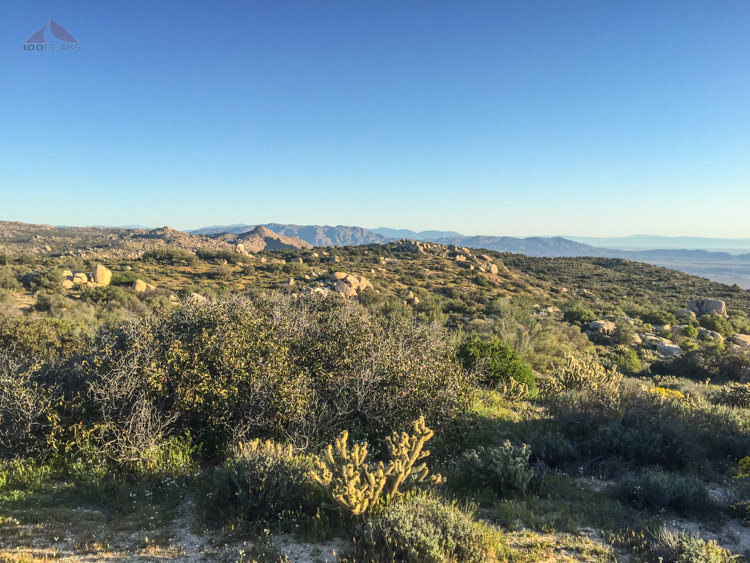 The drive north on McCain Valley Road was very straightforward as I recalled my visit to Mount Tule, my last San Diego Peak before I moved away, which is off the same road. The Sunrise Powerlink appeared to be complete in this area, and it wasn't as bad as I remembered. However, I am not a resident here, so cannot speak to its intrusion. I passed the Lark Valley Campground, and noticed only one car camping there. They were just getting up with the sun. I made it to the Carrizo Overlook and parked my car. I was the only one there. Once again, I had the mountain to myself. 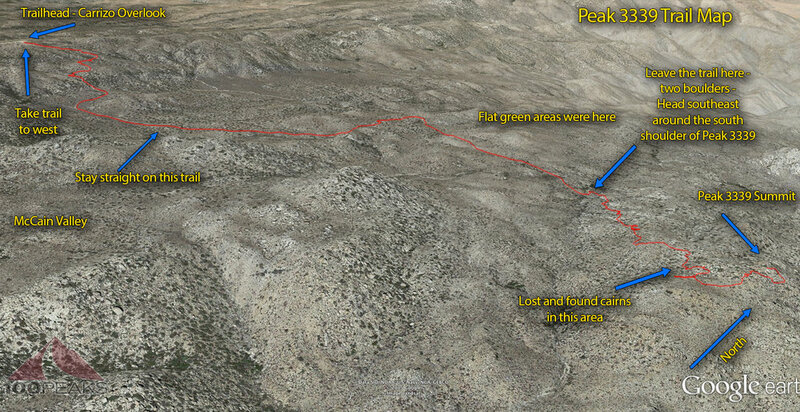 From the edge of the trailhead, I could see Peak 3339 to the east and Carrizo Gorge beyond. The sun was rising and, although chilly at the moment, I knew it was going to be warm. I immediately started off in the wrong direction. From where I parked the car on the north end of the turnaround, there was an obvious trail leading north. Without checking my map, I grabbed my things and headed that way. The trail sloped downward and continued north. And north. About 20 minutes into the hike, I checked my map and realized I was hiking on the wrong trail. I retraced my steps and then found the trail I wanted heading southeast from the trailhead. I passed a couple of day use picnic benches and fire rings and dropped down to a viewpoint with an informational sign. The trail continued downward around the stone wall and continued downward. I knew I would be coming back up this hill by the end of the day. 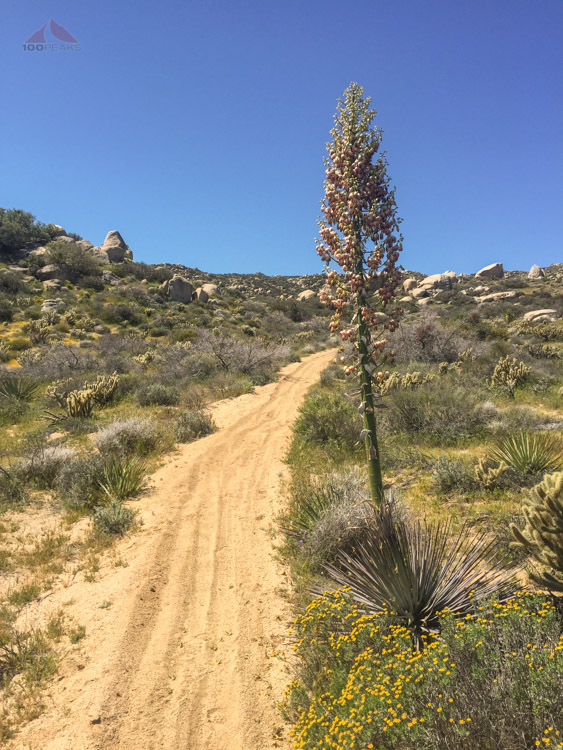 I continued downward, noticing the desert alive with flowers and that a mountain lion crossed this trail several times along the upper elevation. Although there were signs reading that OHV were not allowed on the trails here, I saw a lot of tire tracks. Luckily, I saw or heard no motorcycles the entire day. Navigation was difficult at times, since there were several parallel and perpendicular trails along the way, and once I walked a short while on the wrong trail before I realized I was again headed in wrong direction. I cut across the desert and met up with the correct trail. The desert was very green. The more I continued toward Peak 3339, the more green I could see. The area to the north opened up into wide mesas, beckoning me to come back and backpack to this area, camping in its remote basins. I could see Sombrero Peak, a ridgeline or two away. Peak 3339 was obvious as a pile of rocks, mostly resting due east as the trail turned here and there. I saw horse tracks on the lower part of the trail and wondered where they met the trail, since those tracks weren't near the car. I'd have to say, that part of the hike was downright pleasant. I wanted to get lost among the meadows and boulders, taking a nap as the cool breeze complemented the rising sun. However, I had a meeting in the afternoon. and Peak 3339 beckoned me from a distance. As the trail turned north again, I knew it was time to leave it. I saw two boulders, each with a smaller rock on top and saw it as a sign to start climbing to the east. I made the mistake of bushwhacking to the north, splitting the peaks. It looked like a smooth contour on the map, but it proved to be an indirect route with a lot of back and forth to find the right way through. I had to skirt the southern edge of Peak 3339, head north between some boulders, turn east and then ascend the summit from the east. Before long, I was scrambling up some rocks and could see forever. I saw there awhile and had some lunch. I texted my wife hello, since I finally had a signal. I answered a business call. I drank some water. I listened to nothing in particular. I felt the rising heat and suddenly noticed hundreds of tiny gnats swarming around my head. I took my hat off and they were all over it, my neck, and my shirt. It was time to go. I scrambled back down, finding a pretty direct path for the most part. I found some cairns that led me roughly northwest back toward the trail. They disappeared, but by then I knew I was headed back toward the two boulders I saw on the way up. I made it back to the trail and made great time until the slope got greater. It was 88F, but I was wearing light-colored gear and had plenty of water. I took my time and enjoyed the green desert while it lasted. Once again, I had a whole hike to myself. And it was just what I needed.